Written by Felipe Azenha & filed in Community, Cyclists & Pedestrians, Data, Urbanism. Smart Growth America is one of the leading advocates for federal policies and programs that support the best in neighborhood development. Its ongoing research helps shape the national discourse on how development strategies can improve the lives of urbanists. In the 2016 Dangerous by Design study by Smart Growth America, the Miami-Fort Lauderdale-West Palm Beach region was ranked eleventh out of the top twenty areas that are the most dangerous for pedestrians. Between 2005 and 2014, there were a total of 1,508 pedestrian deaths in this area (click here and go to page 5). Florida has the unfortunate honor of topping out as number one on the Pedestrian Danger Index (PDI) – click here and go to page 9). In fact, the Sunshine State is number one on the most dangerous list for the fourth consecutive time. It’s also home to eight of the ten most dangerous metro areas in the nation. Smart Growth America holds the firm belief that the way streets are designed is a major factor in fatal vehicle collisions. Many pedestrian deaths happen because of a lethal combination of fast-moving cars and poor pedestrian infrastructure. As long as roads are built to prioritize high speeds at the cost of pedestrian safety, this will remain a problem. Policy makers at every level – local, state, and national – can and must take action to protect pedestrians from being struck and killed by cars. The following table is from the Florida Dept. of Transportation (FDOT) and purports to show the number of vehicle crashes along Biscayne Boulevard during the past eight years. If you add up these figures, you get a total of 2,553 crashes over this eight-year period (and 2018 isn’t even finished yet). FDOT also states that these crashes involved 64 pedestrians and/or cyclists. In spite of these statistics, in correspondence with the FDOT, the impression that is being conveyed is that FDOT doesn’t believe there is a safety issue along Biscayne Boulevard. My Personal Story: I use Biscayne Boulevard on a daily basis as a pedestrian, cyclist, and motorist. As a regular user, I have had personal experience of the danger of trying to cross Biscayne Boulevard at 72nd Street. In trying to cross with my five-year-old son, we have nearly been hit numerous times by motor vehicles, which also almost resulted in cars being rear-ended while we were trying to cross. During the past 8 years, I have conservatively witnessed at least 70 crashes, which have resulted in vehicles hitting pedestrians, cyclists, trees, mid-block crosswalk signals, traffic signs, light poles, bus shelters, and/or traffic signals. Why is Biscayne Boulevard so Dangerous? Many of the mid-block crosswalks are not working and aren’t repaired in a timely manner. Even though both FDOT and Miami Dade Transit (MDT) have been made aware of this problem, the crosswalks still have not been repaired. School has started, and it’s just reprehensible that there are not enough safe crosswalks to cross Biscayne Boulevard. In fact, the principal at Morningside Academy arranged for students to be bused three blocks to Legion Park because Biscayne Boulevard is too dangerous to cross. This is absolutely not acceptable. FDOT claims that repairs are the responsibility of MDT. There is obviously plenty of room for improvement, yet the crash data that FDOT has provided does not seem to sufficiently motivate FDOT to make Biscayne Boulevard safer. The question must be asked, just how many more crashes and pedestrian/cyclist injuries/fatalities have to occur, to make safety along Biscayne Boulevard an FDOT top priority? The mid-block crosswalks along Biscayne Boulevard are fairly recent installations. Unfortunately, although this may have seemed like a good idea, these crosswalks are being regularly hit by speeding vehicles and then not repaired in a timely manner. So, it would seem that this is an experiment that is not working out. What is FDOT Doing to Improve Safety? It seems that FDOT’s only solution to the problem of pedestrian safety is to add more mid-block crosswalks without also addressing the problem of design speed and speeding vehicles. 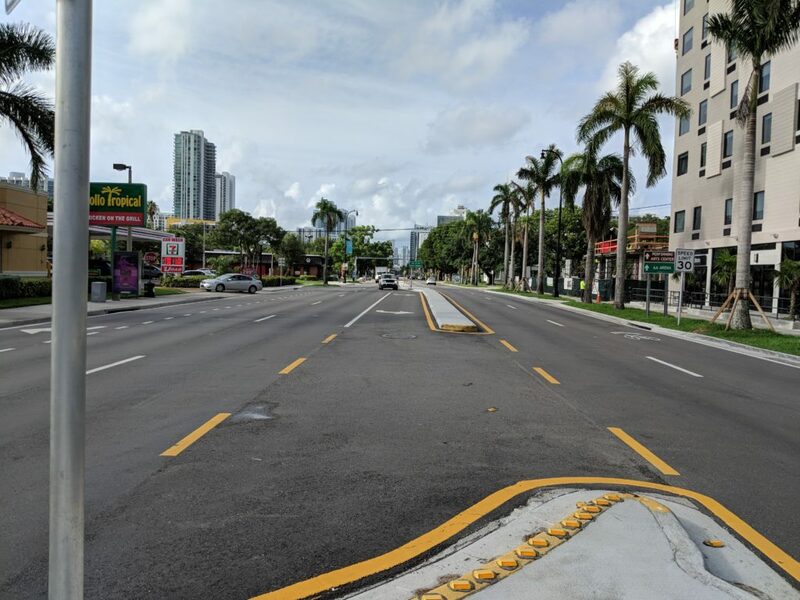 This approach begs the question, how does adding more mid-block crosswalks, which are constantly being hit by speeding cars and in need of repair, make Biscayne Boulevard safer for pedestrians and cyclists? In addition, from the data FDOT provided, it could be concluded that mid-block crosswalks may have contributed to 32 rear-end collisions. How many crashes involved cyclists? : Response: 15 (0.0059%). How many crashes involved pedestrians at mid-block crosswalks? : Response: 1 (0.0004%). How many rear-end crashes have occurred at mid-block crosswalks? : Response: 32 (0.0125%). Why does it take so long to make repairs to mid-block crosswalks if safety is FDOT ’s number one priority? How do mid-block crosswalks improve safety when they hardly ever work because they have been hit by motor vehicles? : Response: Repairs are the responsibility of Miami Dade County. The crashes include all modes of transportation. 49 crashes out of the total 2,553 involved pedestrians. Most of the crashes are rear-enders occurring at signalized intersections. The major contributing causes to the crashes are human error, distractions, and careless driving; not speeding. It’s unclear if the number of crashes (2,553) provided by FDOT only includes collisions between motor vehicles. We don’t know if it also includes crashes into light poles, traffic signs, traffic lights, bus stops, medians, mid-block crosswalks, trees, etc, where an accident report may have not be filed. MDT was made aware nearly 4 months ago that many of the mid-blocks crosswalks along Biscayne Boulevard were not working properly; however, it took MDT nearly four months to reply to weekly emails as to why the mid-block crosswalks haven’t been repaired or when they will be repaired. Last week we were informed by MDT that many of the mid-block crosswalks will need to be replaced entirely because they are irreparable. It will likely be at least another 6 months before repairs will be made because the repair project needs to go to RFP. It seems reasonable that repairs should be made within two to four weeks, not 10 months. Although careless and/or distracted driving is likely the cause of many crashes, the reality is that careless road/street design also plays a significant part in many unnecessary crashes. It seems many of these crashes could be avoided with proper traffic calming initiatives which FDOT has failed to implement after repeated requests from area residents and businesses. If safety is the highest priority for FDOT, it would seem logical that FDOT would have put a project in place to reduce the design speed (not reduce the speed limit) of this road. Unfortunately, it seems that FDOT’s only solution is to add more mid-block crosswalks without also addressing the design speed of the road. Safety and mobility for all users of the transportation system – whether they are motorists, bicyclists, or pedestrians – are the highest priorities for FDOT. Meaningful enforcement, awareness through education, and engineering are the three legs of the FDOT’s safety program. It is recognized that pedestrians, bicyclists, and drivers alike can become complacent about safety in the prolonged absence of effective traffic enforcement. Rules of the road are in place to protect all users, and each user has the responsibility to adhere to the rules specific to them. Routine and on-going enforcement is essential to any successful strategy. Speed Limits – The proper posting of speed limits is important. Speed limits are established in part on the function of the roadway and in part on user behavior. Biscayne Boulevard is one of our city’s main arteries, and it carries about 30,000 vehicles every day. It also provides connectivity and mobility to thousands of pedestrians. The current posted speed limits represent a balanced approach to meeting the needs of all users, but again, success depends largely on on-going enforcement and education. 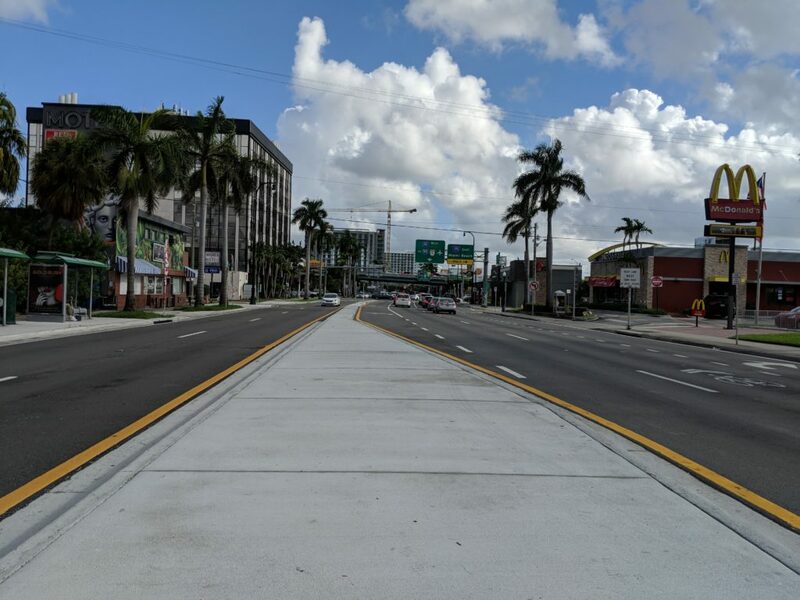 Let’s also take an opportunity to highlight a recent FDOT project that was completed on Biscayne Boulevard which illustrates how FDOT does not consider pedestrians. A new center median was constructed from 33rd St. to 36th St., but FDOT failed to include any crosswalks for three blocks. Per the Miami 21 Zoning Code, this area allows for mixed-use zoning and allows up to 150 dwelling units per acre. See full development potential for this area below. This is already a densely populated area, and as you can see, it will only become more densely populated in the coming years. Local Zoning Ignored: Miami 21 is a form-based code that encourages walkability and less reliance on motor vehicles. How does this project help to meet this goal? It appears that FDOT ignores local zoning codes and the current built environment when implementing projects within a densely populated urban area. It’s really tough to understand how FDOT can justify not including a crosswalk in this project. But, FDOT has confirmed that there are no new crosswalks planned between 33 and 36 Streets. Total development potential along Biscayne Boulevard from 33rd St. to 36th St. Zoning study courtesy of Gridics. Per the Miami 21 Zoning Code, this area allows for mixed-use zoning and allows up to 150 dwelling units per acre, however FDOT did not include a crosswalk in a recent Biscayne Boulevard resurfacing and median project form 33rd Street to 36th Street. Everyone involved in the design of streets – from federal policymakers to local elected leaders to transportation engineers – must take the necessary action to reduce pedestrian deaths. Collectively, there’s much more we can do to make Biscayne Boulevard safer for everyone and the authorities cannot continue to turn a blind eye. How many more crashes and pedestrian/cyclist injuries/fatalities do we need in order to make safety along Biscayne Boulevard a priority for FDOT and MDT?